Once children have become familiar with matching the familiar objects, they can be encouraged to say aloud the names of the different objects. 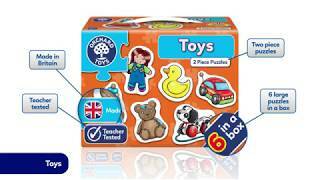 Six large, 2-piece jigsaw puzzles for age 18 months and over. These colourful jigsaws depict familiar first toys children will enjoy, including a teddy bear, a doll and a toy car. Once children have become familiar with matching the familiar objects, they can be encouraged to say aloud the names of the different objects. The bright imagery is great to engage early learners and the sturdy material is set to last the wear and tear of little hands!